Brazil has raised its benchmark interest rate to 9% from 8.5% in a further attempt to rein in inflation. The central bank's monetary policy committee, the Copom, voted unanimously for a third straight half percentage point rate rise. The Copom left the door open for more hikes by reiterating that the latest rise is part of an ongoing rate-adjustment process. A fall in the value of Brazilian real has stoked inflation, currently 6.15%. The currency's fall has been blamed on an outflow of capital triggered by expectation that the US Fed will end its stimulus policy, leading to a stronger dollar. The real has lost 20% of its value against the dollar since the start of the year. Other emerging nations, including in southeast Asia, have suffered similar currency problems. Higher interest rates would help Brazil control inflation, and also bolster investors' confidence, the International Monetary Fund said in a report on Wednesday. Fabio Akira, chief Brazil economist at JPMorgan, said further rate hikes were likely. He is forecasting a 50 basis points rise in October and another 25 points rise later in the year. 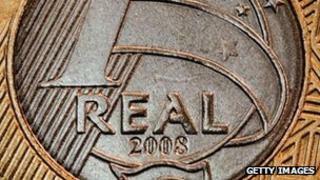 Last week, the real fell to as low as 2.45 to the dollar, its lowest level since December 2008.